Designed to be comfortable to live on for weeks at a time and with a proven reputation for soaking up the miles and shrugging off the years, the Trader 47 makes a solid second-hand buy whose value and appeal should hold firm for many more years to come. These fine built Trawler Yachts are renowned for their sea keeping qualities and would make an ideal Livaboard or for exploring longer distances. Just lifted back in the water in June 18 after being antifouled, polished with shafts and props cleaned and new anodes. As soon as you step aboard this capable Motor Yacht it has a very comfortable and reassuring feel about her. Constructed with a very substantial and quality fit out, and finished in very tasteful colours. The amount of space, light and height everywhere makes it a very pleasant place to be. The upholstery throughout is in excellent condition with new seats on the Flybridge. She has been sensibly priced and ready for new owners to enjoy her. 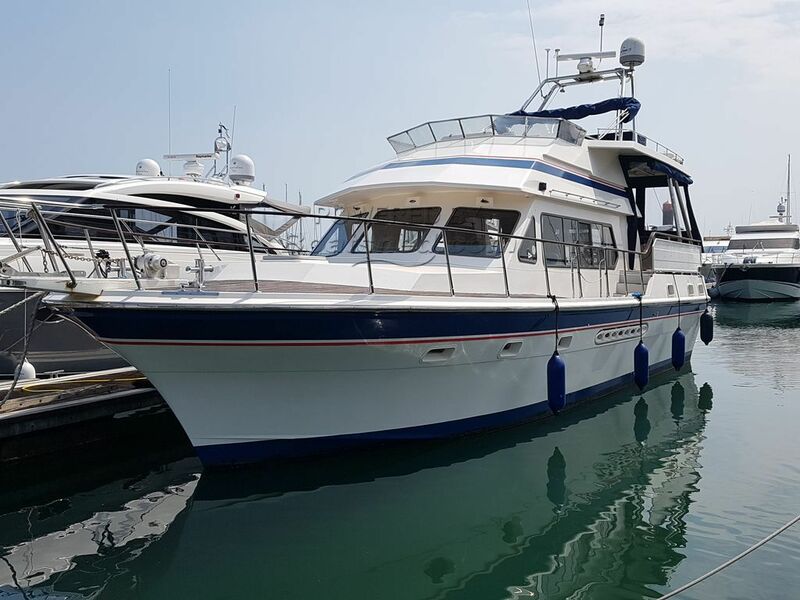 This Trader 47 Sunliner has been personally photographed and viewed by Phil Key of Boatshed Torquay. Click here for contact details.